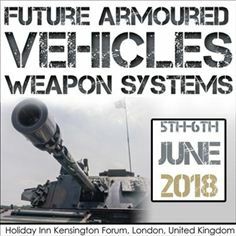 SMi’s 3rd annual Future Armoured Vehicles Weapon Systems conference will be returning to London this summer to host a wealth of debate and discussions around developing the next generation of fire superiority for armoured combat vehicles. With asymmetric warfare at an all-time high, armoured vehicles are continuously required to operate across diverse environments against varying enemy forces, and need to be able to deliver the firepower required to eliminate these heterogeneous hazards. Whether exploiting surface-to-air missiles to counter airborne units, infantry fighting capabilities or beyond line of sight ranged artillery in support of advancing soldiers, modern armoured vehicles continue to rely on a myriad of weapon systems to deliver the lethality required to achieve their mission objectives. 8 key topics discussed: International and Host Nation Keynote Presentations, Next Generation Armoured Vehicle Capability, Industry Technical Developments – Ammunition and Turrets, US Army Cavalry Platforms Present and Future, Weapon System Optimisation across North America, Industry Perspectives on Armoured Vehicle Development, Weapon System Trials, Research and Development, Open Architecture Approaches to Armoured Assets. 4 comprehensive technical briefings from: Rheinmetall discussing “Technical Updates On The Puma Ifv Weapon Systems – Developments And Way Forward”, CTA International presenting “Technical Updates On The Internal Ballistics And Munitions Used Within The Scorpion Programme”, FNSS Savuma Sistemleri A.S speaking on “Designing The Future: Delivering Innovative Firepower Capabilities Through New Weapon Systems” and BAE Systems Hagglunds AB discussing “In Peace Time Only Simple Things Are Possible, In War Time Not Even That”. 9+ different nations attending: The United States, Israel, Canada, Germany, Belgium, France, Italy, Sweden, Turkey, UK and more. 2 Sponsors showcasing the latest technologies: SMi’s latest sponsors are CMI Defence and Leonardo who will both be presenting and exhibiting the latest cutting-edge solutions and technologies that are revolutionising how military forces conduct mechanised warfare. For sponsorship and exhibition queries please contact Justin Predescu at jpredescu@smi-online.co.uk. For delegate queries please contact James Hitchen at jhitchen@smi-online.co.uk. For media queries please contact Natasha Boumediene at nboumediene@smi-online.co.uk.